Cowboys in the UK? Yes, sir! 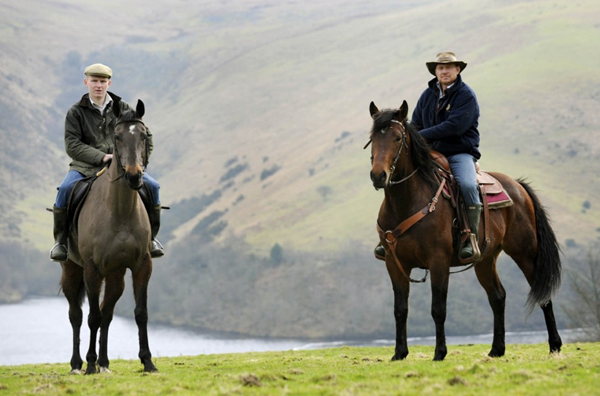 Phil Heard is a beef and sheep farmer and a British cowboy, who drives cattle though England's wild moors in "War Horse" country and invites guests to come with him for the ride with Dartmoor Riding Holidays. Phil Heard's working farm, Meldon, is located in picturesque Dartmoor National Park in Devon, England. This area has recently become even more famous because Dartmoor was used for filming much of Steven Spielberg's "War Horse" film. The author, Michael Morpurgo, based the setting of his book in Iddesleigh, a village not far from the farm. It's in these beautiful rolling, green hills on the family fram that Phil has developed the only cattle drive vacations in the UK. 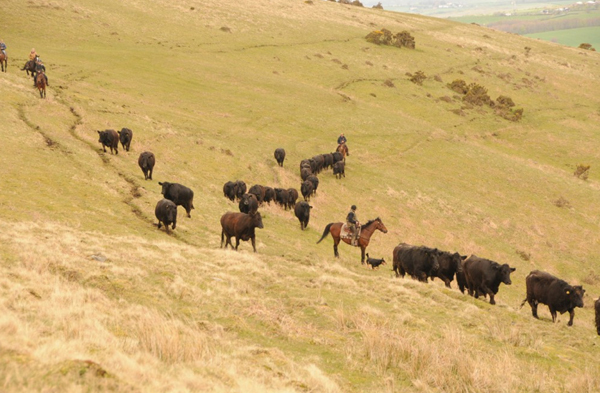 Riding with Dartmoor Riding Holidays, guests can be part of a traditional cattle drive, moving up to 150 head of cattle over expansive moorland and across streams and rivers, where the land looks the same as it would have hundreds of years ago. They may also take in "War Horse" sights and enjoy horse rides to the pub, fishing, hking, cycling and area historic sites, like the ancient market town of Okehampton with Okehampton Castle. Phil took some time out of the saddle to be interviewed for Equitrekking's Meet Your Host, where we learn more about the wonderful local equestrians who lead riders on riding vacations throughout the world, opening their homes and lives to travelers. 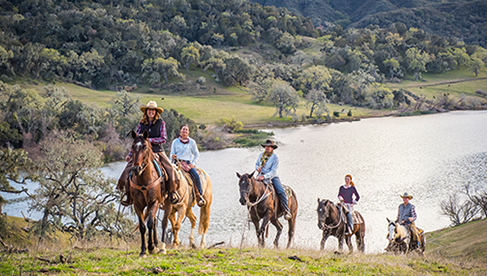 Equitrekking: What inspired you to own and run your ranch? Phil Heard: My father Courtney bought the home farm, Meldon, in 1958. 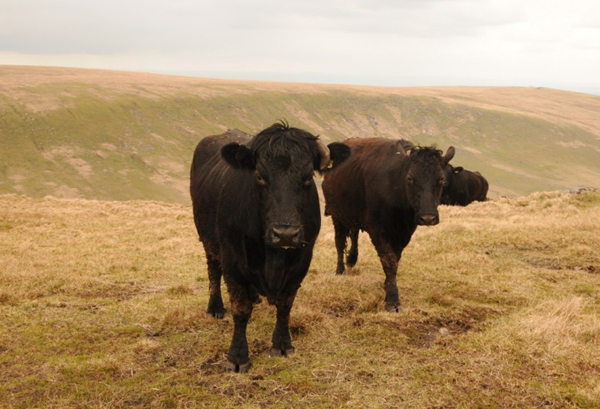 It has been added to over the years, and now totals 1000 acres, plus grazing rights over 1000’s of acres of Dartmoor. I started working when he left school in 1980, married Mandi in 1990, and have 3 sons, Darcy, Lloyd and Giles. The farm was hit by the Foot & Mouth Disease (FMD) outbreak of 2001 when most of the livestock was slaughtered. Following FMD, Courtney stepped back and allowed me and my wife Mandi to take over running the farm. I rebuilt the herds and flocks and in 2008 was awarded the prestigious ‘Farmers Weekly’ ‘Beef farmer of the year award’. My passion has always been beef cattle and horses. We have always used horses to move the cattle and sheep. Many friends had said they always wanted to join me moving the cattle and sheep with the horses. So in 2011, we started ‘Dartmoor Riding Holidays’, offering a different challenge to the more experienced rider. Equitrekking: What is most special about your location in Dartmoor National Park in Devon, England? Phil Heard: Fantastic scenery, wide open spaces, spectacular views and great riding country. Equitrekking: What level of rider do you need to be to visit your working ranch for a UK riding vacation? Phil Heard: We take strong intermediate or experienced riders at our Devon farm. Equitrekking: Do guest’s have a favorite activity either in or out of the saddle? If so, what? Phil Heard: Pub rides, cattle moving, and our horse clinics. Equitrekking: What do travelers find most surprising when they visit you? Phil Heard: The wide open spaces. They are not usually found in the UK, which makes our farm pretty special. 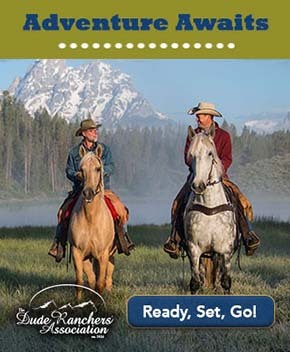 Learn about great riding holidays in the Equitrekking Vacation Guide, a searchable resource featuring dude ranches, guest ranches, cattle drives and great riding vacations around the world and at Top20Ranches.com.